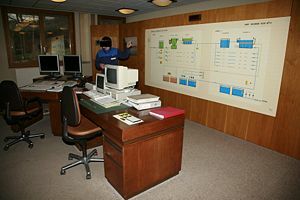 Control room and schematics of the water purification plant to Bret lake (Lac de Bret) in Switzerland. Water purification is the process of removing contaminants from a raw water source. The goal is to produce water for a specific purpose with a treatment profile designed to limit the inclusion of specific materials; most water is purified for human consumption (drinking water). Water purification may also be designed for a variety of other purposes, including to meet the requirements of medical, pharmacology, chemical and industrial applications. It may be carried out by a variety of methods, including treatment with ultraviolet light, filtration, water softening, reverse osmosis, ultrafiltration, molecular stripping, deionization, and carbon treatment. Water purification may remove such contaminants as particulate sand, suspended particles of organic material, parasites (such as Giardia and Cryptosporidium), bacteria, algae, viruses, fungi, and toxic metals (such as lead, copper, and chromium). Minerals such as calcium, silica, and magnesium may also be removed. Some purification may be elective in the purification process, including the removal of smell (hydrogen sulfide remediation), taste (mineral extraction), and color (from iron incapsulation). Governments usually dictate the standards for drinking water quality. These standards require minimum and maximum set points of contaminants and the inclusion of control elements that produce drinking water. Quality standards in many countries require specific amounts of disinfectant (such as chlorine or ozone) in the water after it leaves the water treatment plant (WTP), to reduce the risk of re-contamination while the water is in the distribution system. Ground water (usually supplied as well water) is typically a more economical choice than surface water (from rivers, lakes and streams) as a source for drinking, as it is inherently pre-filtered by the aquifer from which it is extracted. Over large areas of the world, aquifers are recharged as part of the hydrologic cycle. In more arid regions, water from an aquifer will have a limited output and can take thousands of years to recharge. Surface water is locally more abundant where subsurface formations do not function as aquifers; however, ground water is far more abundant than the more-visible surface water. Surface water is a typical raw water source used to make drinking water where it is abundant and where ground water is unavailable or of poor quality. However, it is much more exposed to human activity and its byproducts. As a water source, it is carefully monitored for the presence of a variety of contaminants by the WTP operators. It is not possible to tell whether water is safe to drink just by looking at it. Simple procedures such as boiling or the use of a household activated carbon filter are not sufficient for treating all the possible contaminants that may be present in water from an unknown source. Even natural spring water—considered safe for all practical purposes in the 1800s—must now be tested before determining what kind of treatment, if any, is needed. Chemical analysis, while expensive, is the only way to obtain the information necessary for deciding on method of purification. Chemical, Elevated, Hydropneumatic and Ground Storage Water Tanks shown together in a collage. The water emerging from some deep ground water may have fallen as rain many decades, hundreds, thousands or in some cases millions of years ago. Soil and rock layers naturally filter the ground water to a high degree of clarity before it is pumped to the treatment plant. Such water may emerge as springs, artesian springs, or may be extracted from boreholes or wells. Deep ground water is generally of very high bacteriological quality (i.e., pathogenic bacteria such as Campylobacter or the pathogenic protozoa Cryptosporidium and Giardia are typically absent), but the water typically is rich in dissolved solids, especially carbonates and sulfates of calcium and magnesium. Depending on the strata through which the water has flowed, other ions may also be present including chloride, and bicarbonate. There may be a requirement to reduce the iron or manganese content of this water to make it pleasant for drinking, cooking, and laundry use. Disinfection may also be required. Where groundwater recharge is practiced, it is equivalent to lowland surface waters for treatment purposes. Shallow groundwaters: Water emerging from shallow groundwaters is usually abstracted from wells or boreholes. The bacteriological quality can be variable depending on the nature of the catchment. A variety of soluble materials may be present including (rarely) potentially toxic metals such as zinc, copper or arsenic. Arsenic contamination of groundwater is a serious problem in some areas, notably from shallow wells in Bangladesh and West Bengal in the Ganges Delta. Upland lakes and reservoirs: Typically located in the headwaters of river systems, upland reservoirs are usually sited above any human habitation and may be surrounded by a protective zone to restrict the opportunities for contamination. Bacteria and pathogen levels are usually low, but some bacteria, protozoa or algae will be present. Where uplands are forested or peaty, humic acids can color the water. Many upland sources have low pH which require adjustment. 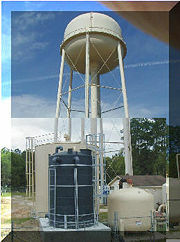 Pumping and containment: The majority of water must be pumped from its source or directed into pipes or holding tanks. To avoid adding contaminants to the water, this physical infrastructure must be made from appropriate materials and constructed so that accidental contamination does not occur. Screening (see also screen filter): The first step in purifying surface water is to remove large debris such as sticks, leaves, trash and other large particles which may interfere with subsequent purification steps. Most deep groundwater does not need screening before other purification steps. Storage: Water from rivers may also be stored in bankside reservoirs for periods between a few days and many months to allow natural biological purification to take place. This is especially important if treatment is by slow sand filters. Storage reservoirs also provide a buffer against short periods of drought or to allow water supply to be maintained during transitory pollution incidents in the source river. Pre-conditioning: Many waters rich in hardness salts are treated with soda-ash (Sodium carbonate) to precipitate calcium carbonate out utilizing the common ion effect. Pre-chlorination: In many plants the incoming water was chlorinated to minimize the growth of fouling organisms on the pipe-work and tanks. Because of the potential adverse quality effects (see chlorine below), this has largely been discontinued. Widely varied techniques are available to remove the fine solids, micro-organisms and some dissolved inorganic and organic materials. The choice of method will depend on the quality of the water being treated, the cost of the treatment process and the quality standards expected of the processed water. Distilled water has an average pH of 7 (neither alkaline nor acidic) and sea water has an average pH of 8.3 (slightly alkaline). If the water is acidic (lower than 7), lime or soda ash is added to raise the pH. Lime is the more common of the two additives because it is cheap, but it also adds to the resulting water hardness. Making the water slightly alkaline ensures that coagulation and flocculation processes work effectively and also helps to minimize the risk of lead being dissolved from lead pipes and lead solder in pipe fittings. Floc floating at the surface of a basin. A mechanical system pushes floc out of the water basin. Flocculation is a process which starts with clarifying the water. Clarifying means removing any turbidity or color so that the water is clear and colorless. Clarification is done by causing a precipitate to form in the water. Initially the precipitate forms as very small particles but as the water is gently stirred, these particles stick together to form bigger particles—this process is sometimes called flocculation. Many of the small particles that were originally present in the raw water absorb onto the surface of these small precipitate particles and so get incorporated into the larger particles that coagulation produces. In this way the coagulated precipitate takes most of the suspended matter out of the water and is then filtered off, generally by passing the mixture through a coarse sand filter or sometimes through a mixture of sand and granulated anthracite (high quality coal). Anthracite, with its high carbon content, is able to absorb much of the organic matter present in solution and this can remove odor and taste from the water. A precipitate that is widely used to clarify water is iron (III) hydroxide. This is formed first by adjusting (if necessary) the pH of the incoming water to above 7 (by adding lime or sodium hydroxide), then by adding a solution of an iron (III) compound such as iron (III) chloride. Iron (III) hydroxide is extremely insoluble and forms even at a pH as low as 7. Aluminium hydroxide is also widely used as the flocculating precipitate. Water exiting the flocculation basin may enter the sedimentation basin, also called a clarifier or settling basin. It is a large tank with slow flow, allowing floc to settle to the bottom. The sedimentation basin is best located close to the flocculation basin so the transit between does not permit settlement or floc break up. Sedimentation basins can be in the shape of a rectangle, where water flows from end to end, or circular where flow is from the center outward. Sedimentation basin outflow is typically over a weir so only a thin top layer-furthest from the sediment-exits.The amount of floc that settles out of the water is dependent on the time the water spends in the basin and the depth of the basin. The retention time of the water must therefore be balanced against the cost of a larger basin. The minimum clarifier retention time is normally 4 hours. A deep basin will allow more floc to settle out than a shallow basin. This is because large particles settle faster than smaller ones, so large particles bump into and integrate smaller particles as they settle. In effect, large particles sweep vertically though the basin and clean out smaller particles on their way to the bottom. As particles settle to the bottom of the basin a layer of sludge is formed on the floor of the tank. This layer of sludge must be removed and treated. The amount of sludge that is generated is significant, often 3 percent to 5 percent of the total volume of water that is treated. The cost of treating and disposing of the sludge can be a significant part of the operating cost of a water treatment plant. The tank may be equipped with mechanical cleaning devices that continually clean the bottom of the tank or the tank can be taken out of service when the bottom needs to be cleaned. After separating most floc, the water is filtered as the final step to remove remaining suspended particles and unsettled floc. The most common type of filter is a rapid sand filter. Water moves vertically through sand which often has a layer of activated carbon or anthracite coal above the sand. The top layer removes organic compounds, which contribute to taste and odor. The space between sand particles is larger than the smallest suspended particles, so simple filtration is not enough. Most particles pass through surface layers but are trapped in pore spaces or adhere to sand particles. Effective filtration extends into the depth of the filter. This property of the filter is key to its operation: if the top layer of sand were to block all the particles, the filter would quickly clog. They are reasonably strong and so can withstand pressure differences across them of typically 2-5 atmospheres. Membrane filters are widely used for filtering both drinking water and sewage (for reuse). For drinking water, membrane filters can remove virtually all particles larger than 0.2 um—including Giardia and cryptosporidium. Membrane filters are an effective form of tertiary treatment when it is desired to reuse the water for industry, for limited domestic purposes, or before discharging the water into a river that is used by towns further downstream. They are widely used in industry, particularly for beverage preparation (including bottled water). However no filtration can remove substances that are actually dissolved in the water such as phosphorus, nitrates and heavy metal ions. Slow sand filters may be used where there is sufficient land and space. These rely on biological treatment processes for their action rather than physical filtration. Slow sand filters are carefully constructed using graded layers of sand with the coarsest at the top and finest at the base. Drains at the base convey treated water away for disinfection. Filtration depends on the development of a thin biological layer on the surface of the filter. An effective slow sand filter may remain in service for many weeks or even months if the pre-treatment is well designed and produces an excellent quality of water which physical methods of treatment rarely achieve. Active coal can fulfill this role. Disinfection is normally the last step in purifying drinking water. Water is disinfected to kill any pathogens which pass through the filters. Possible pathogens include viruses, bacteria, including Escherichia coli, Campylobacter and Shigella, and protozoans, including G. lamblia and other Cryptosporidia. In most developed countries, public water supplies are required to maintain a residual disinfecting agent throughout the distribution system, in which water may remain for days before reaching the consumer. Following the introduction of any chemical disinfecting agent, the water is usually held in temporary storage—often called a contact tank or clear well to allow the disinfecting action to complete. Chlorination- The most common disinfection method is some form of chlorine or its compounds such as chloramine or chlorine dioxide. Chlorine is a strong oxidant that kills many micro-organisms. Chloramines are another chlorine-based disinfectant. Although chloramines are not as strong of an oxidant or provide a reliable residual, as compared to chlorine gas or sodium hypochlorite, they are less prone to form THMs or haloacetic acids. It is possible to convert chlorine to chloramine by adding ammonia to the water along with the chlorine: The chlorine and ammonia react to form chloramine. Water distribution systems disinfected with chloramines may experience nitrification, wherein ammonia is used a nitrogen source for bacterial growth, with nitrates being generated as a byproduct. Ozone (O3) is a relatively unstable molecule "free radical" of oxygen which readily gives up one atom of oxygen providing a powerful oxidizing agent which is toxic to most water borne organisms. It is a very strong, broad spectrum disinfectant that is widely used in Europe. It is an effective method to inactivate harmful protozoans that form cysts. It also works well against almost all other pathogens. Ozone is made by passing oxygen through ultraviolet light or a "cold" electrical discharge. To use ozone as a disinfectant, it must be created on site and added to the water by bubble contact. Some of the advantages of ozone include the production of relatively fewer dangerous by-products (in comparison to chlorination) and the lack of taste and odor produced by ozonation. Although fewer by-products are formed by ozonation, it has been discovered that the use of ozone produces a small amount of the suspected carcinogen Bromate, although little Bromine should be present in treated water. Another one of the main disadvantages of ozone is that it leaves no disinfectant residual in the water. Ozone has been used in drinking water plants since 1906 where the first industrial ozonation plant was built in Nice, France. The U.S. Food and Drug Administration has accepted ozone as being safe; and it is applied as an anti-microbiological agent for the treatment, storage, and processing of foods. UV radiation (light) is very effective at inactivating cysts, as long as the water has a low level of color so the UV can pass through without being absorbed. The main disadvantage to the use of UV radiation is that, like ozone treatment, it leaves no residual disinfectant in the water. Fluoridation: in many areas fluoride is added to water for the purpose of preventing tooth decay. This process is referred to as water fluoridation. Fluoride is usually added after the disinfection process. In the United States, fluoridation is usually accomplished by the addition of hexafluorosilicic acid, which decomposes in water, yielding fluoride ions. Plumbosolvency reduction: In areas with naturally acidic waters of low conductivity (i.e surface rainfall in upland mountains of igneous rocks), the water may be capable of dissolving lead from any lead pipes that it is carried in. The addition of small quantities of phosphate ion and increasing the pH slightly both assist in greatly reducing plumbo-solvency by creating insoluble lead salts on the inner surfaces of the pipes. Fluoride Removal: Although fluoride is added to water in many areas, some areas of the world have excessive levels of natural fluoride in the source water. Excessive levels can be toxic or cause undesirable cosmetic effects such as staining of teeth. One method of reducing fluoride levels is through treatment with activated alumina. Boiling: Water is boiled for a sufficient duration to inactivate or kill microorganisms that normally live in water at room temperature. Near sea level, a vigorous rolling boil for at least one minute is sufficient. At high altitudes (higher than two kilometers or 5,000 feet), three minutes is recommended. In areas where the water is "hard" (that is, containing significant concentrations of dissolved calcium salts), boiling decomposes the bicarbonate ions, resulting in partial precipitation as calcium carbonate. This is the "fur" that builds up on kettle elements in hard water areas. With the exception of calcium, boiling does not remove solutes of higher boiling point than water and in fact increases their concentration (due to some water being lost as vapor). Boiling does not leave a residual disinfectant in the water. Therefore, water that has been boiled and then stored for any length of time may have acquired new pathogens. Carbon filtering: Charcoal, a form of carbon with a high surface area, absorbs many compounds including some toxic compounds. Water passing through activated charcoal is common in household water filters and fish tanks. Household filters for drinking water sometimes contain silver to release silver ions which have an anti-bacterial effect. Distillation involves boiling the water to produce water vapor. The vapor contacts a cool surface where it condenses as a liquid. Because the solutes are not normally vaporised, they remain in the boiling solution. Even distillation does not completely purify water, because of contaminants with similar boiling points and droplets of unvaporised liquid carried with the steam. However, 99.9 percent pure water can be obtained by distillation. Distillation does not confer any residual disinfectant and the distillation apparatus may be the ideal place to harbor Legionnaires' disease. The use of iron in removing arsenic from water. Portable techniques for purifying water are used for hiking or camping, or for use in rural areas or emergency situations. Common techniques include boiling, disinfection with tablets or ultra-filtration using a small hand pump. For the small scale production of hydrogen, water purifiers are installed to prevent formation of minerals on the surface of the electrodes and to remove organics and chlorine from utility water. First, the water passes through a 20-micrometer interference (mesh or screen filter) filter to remove sand and dust particles, then a charcoal filter using activated carbon to remove organics and chlorine and, finally, a de-ionizing filter to remove metallic ions. Testing can be done before and after the filter to verify the proper removal of barium, calcium, potassium, magnesium, sodium, and silicon. Another method that is used is reverse osmosis. There has been controversy over the fluoridation of water since the 1930s, when the benefits to dental health were first identified. Water supplies have sometimes been the subject of concerns over terrorism and actual terrorist threats. Accidents have also been known to happen. In April, 2007, the water supply of Spencer, Massachusetts, became contaminated with excess lye (sodium hydroxide) when its treatment equipment malfunctioned. ↑ Emergency Disinfection of Drinking Water, U.S. EPA. Retrieved December 5, 2007. Crittenden, John. 2005. Water Treatment: Principles and Design. 2nd ed. MWH. Hoboken, NJ: J. Wiley. ISBN 0471110183. Letterman, Raymond D. 1999. Water Quality and Treatment: A Handbook of Community Water Supplies. 5th ed. American Water Works Association. New York: McGraw-Hill. ISBN 0070016593. Masters, Gilbert M., and Wendell Ela. 2008. Introduction to Environmental Engineering and Science. 3rd ed. Upper Saddle River, NJ: Prentice Hall. ISBN 9780131481930. Viessman, Warren, and Mark J. Hammer. 2005. Water Supply and Pollution Control. Upper Saddle River, NJ: Pearson Prentice Hall. ISBN 0131409700. Ground Water and Drinking Water. – United States Environmental Protection Agency. This page was last modified on 11 August 2013, at 21:00.